Stephen Hawking has suggested that a primary cause of our inability to detect any signs of advanced extraterrestrial life could be due to supernovas, which occur one per second in the universe, and would likely wipe out any life within 30 light years. Now, a team of astronomers has detected a flash of light from the companion to an exploding star. This is the first time astronomers have witnessed the impact of an exploding star on its neighbor. It provides the best evidence on the type of binary star system that leads to Type Ia supernovae. This study reveals the circumstances for the violent death of some white dwarf stars and provides deeper understanding for their use as tools to trace the history of the expansion of the universe. These types of stellar explosions enabled the discovery of dark energy, the universe's accelerating expansion that is one of the top problems in science today. 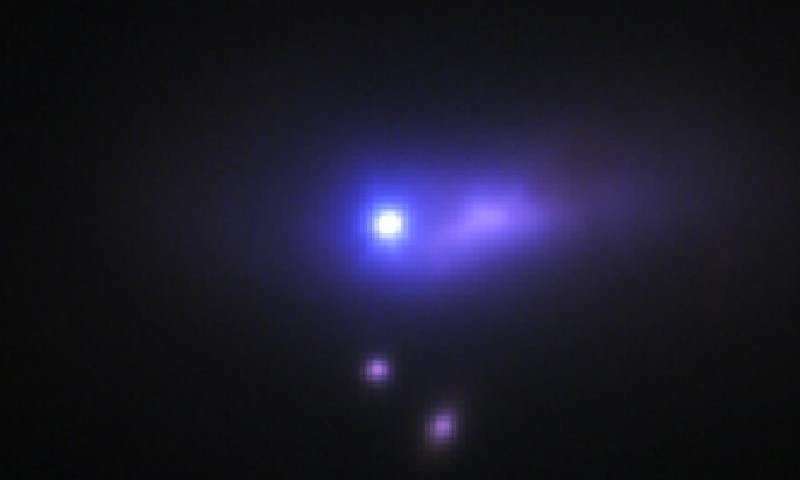 "We think that Type Ia supernovae come from exploding white dwarfs with a binary companion," said Howie Marion of The University of Texas at Austin (UT Austin), the study's lead author. "The theory goes back 50 years or so, but there hasn't been any concrete evidence for a companion star before now." "This is the first time a normal Type Ia has been associated with a binary companion star," said team member and professor of astronomy J. Craig Wheeler (UT Austin). "This is a big deal." According to team member Robert P. Kirshner of the Harvard-Smithsonian Center for Astrophysics, "If a white dwarf explodes next to an ordinary star, you ought to see a pulse of blue light that results from heating that companion. That's what theorists predicted and that's what we saw. Supernova 2012cg is the smoking — actually glowing — gun: some Type Ia supernovae come from white dwarfs doing a do-si-do with ordinary stars." The work is published today in The Astrophysical Journal. The Daily Galaxy via CfA and The University of Texas at Austin. New Light on Our Accelerating Universe –"Not as Fast as We Thought"